Ancient secrets lie in wait throughout Avzar – items of immense power, engraved in archaic runic glyphs and coveted by adventurers and treasure hunters. These are Runes – a vital system for powering up your character and a stepping stone to competitive Might in Taichi Panda. 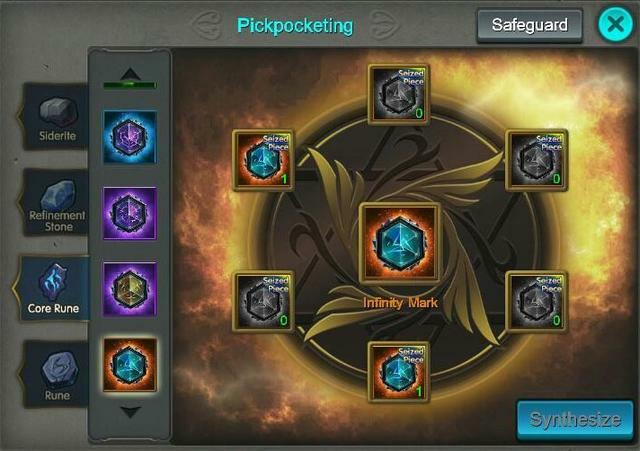 This week, we team up with community guide writer Lemon Kush, for this Taichi Mastermind User Guide – Runes. The rune system is unlocked at level 19. At that level, Runes can be imbedded into pieces of gear. 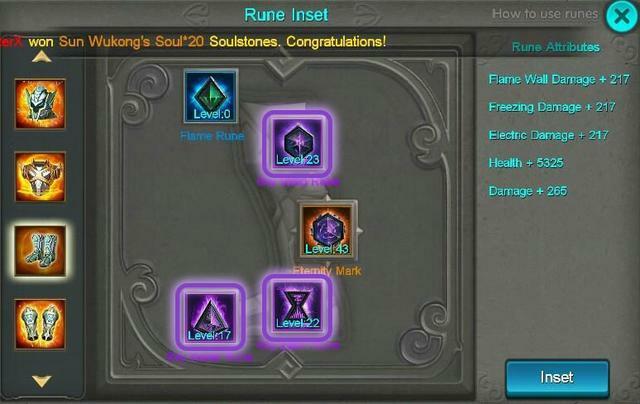 As you level up more, more gear will open up slots to imbed Runes. Runes that are imbedded provide additional attributes such as damage+, health+, flame wall damage+, freezing damage+ and electric damage+. There are 5 types of runes. Each of these Runes has a set spot that it can be placed on a given piece of gear. Each piece of gear can only have one of each Rune placed in it. In addition to 5 types of Runes, there are also different levels of Rune, much like gear – Green being the lowest, then Blue, then Purple, then Orange. There are many ways to obtain new runes. 1. 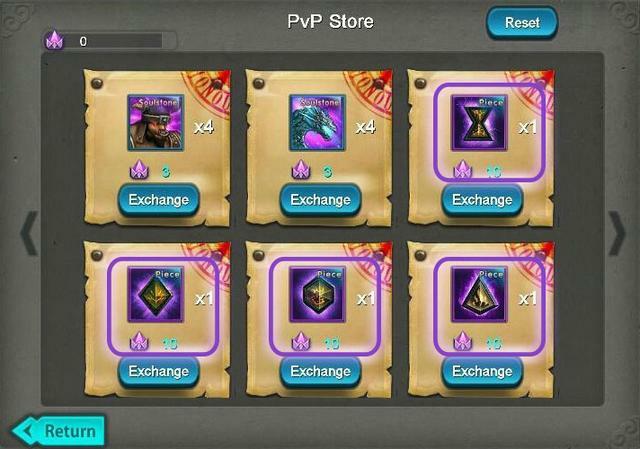 PVP - The first way is to obtain rune pieces via PVP. Click the fortitude button on the left then click PVP. Queue up between noon and midnight server time and obtain PVP tokens, you can spend these tokens in the PVP store which can also be found within the PVP menu. 2. 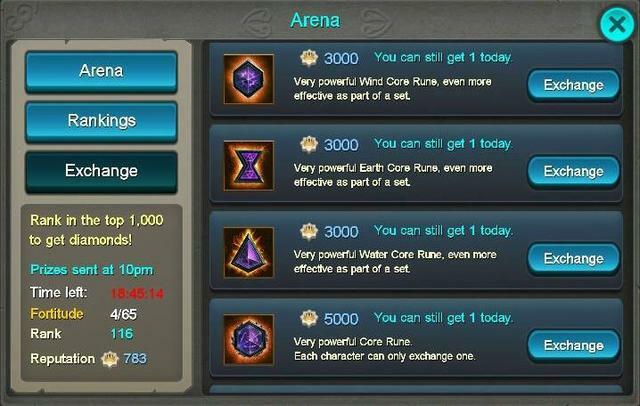 ARENA - The second way to obtain Runes is in the Arena. Challenging and defeating fellow players will improve your rank, and with it how much Reputation you will receive each day. Reputation will be received via mail at 10PM server time every day. Reputation can be used in the exchange tab (also in the arena menu) where you can buy quality 28 runes for 3,000 – 5,000 reputation. This are incredibly valuable, but likewise very expensive. 3. PICKPOCKET - The third way is to pickpocket other players to receive seized pieces which can be synthesized into a rune. This method only yields Core Runes. To enter Pickpocketing, click the fortitude button on the left then click Pickpocket. Then click the Core rune tab. Once in the core rune tab you can select which rune you’d like to seize pieces for. Important Note: you will need at least one piece of a given Rune before you can start stealing pieces. These fragments can be acquired as rewards for regular levels. Once you find a player with a piece of the Rune you want, you can attempt to Plunder the item from them. The fight is automatic, so the result will be based on the relative level/might of you and the enemy. Once you have all of the pieces, you will be able to synthesize them into a whole Rune. The more valuable or high level a Rune, the more pieces it will take to complete synthesis. 4. BLACK MARKET - The fourth way is the black market. Click the market button on the bottom of your screen, with the market tab you can smelt down purple grade or higher pieces of gear in return you will receive crystals. Crystals are the currency you will need to purchase rune shards. Rune shards will appear in the market at random so there won’t always be runes to purchase. 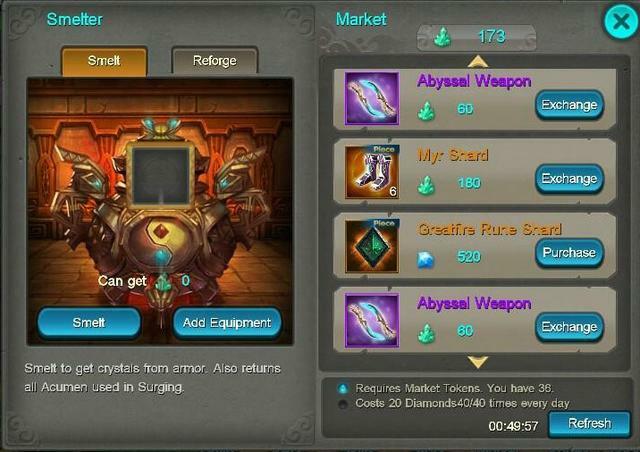 Use market tokens or diamonds to refresh the market for additional chances at receiving runes for purchase in the market. 5. 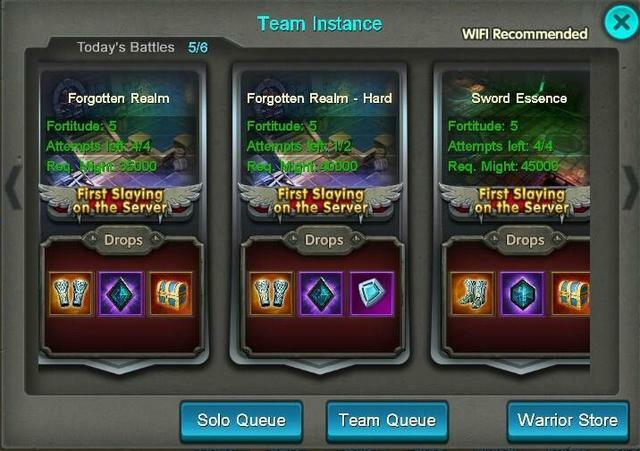 TEAM INSTANCES - The fifth way to receive runes is the team instances. Team up with other players to kill bosses and you will have chances to receive runes as a reward for completing the instance. Aside from their base stats, some runes have set bonuses. That means that equipping several of the same set will grant a special bonus stat boost. In this picture, 3 of the “Sky” set of Runes are Equipped. Insetting multiple of a given set, like the Sky set above, will give large set bonuses. 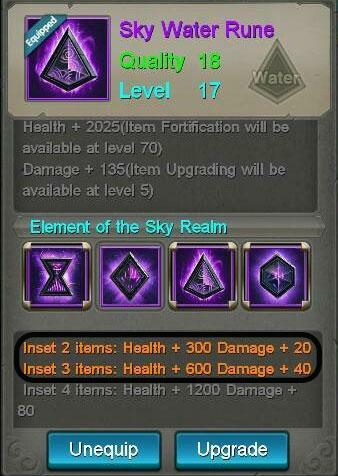 For example, having the 3 Sky Runes equipped give a +600 Health and a +40 Damage boost. It’s important to keep track of these set bonuses, as in some cases it can be more valuable to keep a set of Blue or Purple Runes then to equip your most powerful Orange one and break up the set. The key is getting enough of the same sets and getting multiple sets so that you get the base attribute bonus plus the set bonus. This way you will get the most stats out of your runes. The "Infinity Mark" core rune is a Quality 26 Rune. Upon reaching level 80 it provides an addition attribute (Damage+ 328). In order to upgrade, simply click the Rune button in the bottom right. Select a rune you wish to upgrade. 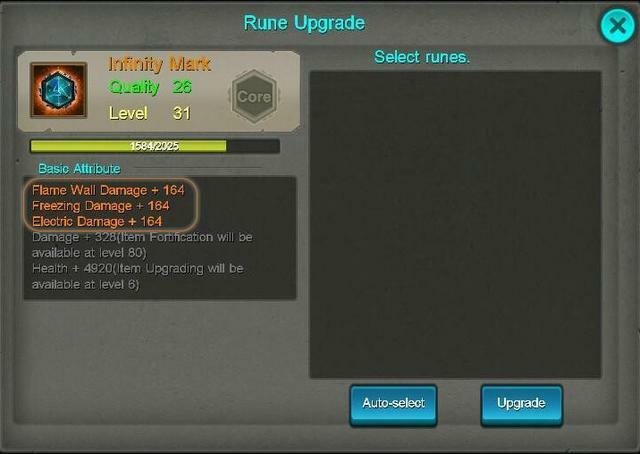 Click upgrade then use other runes in your inventory to upgrade your rune. Just like with gear, you can upgrade your equipped Rune by combining it with other Runes. You can either click the runes you wish to use to upgrade individually, or click auto-select. Auto-Select will automatically select runes for you and it is best to check over your runes for set runes ahead of time. 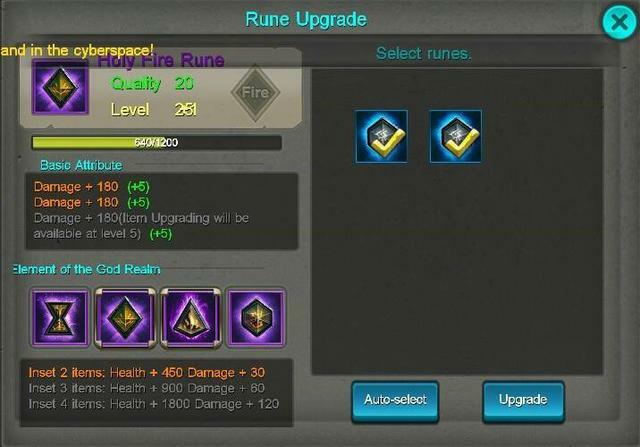 Click upgrade once you have runes you wish to use to upgrade another rune and click the upgrade button. You will lose those runes to level the rune you selected but you should had gained experience or levels to your rune. The Experience gained by a given Rune is relative to its Quality, with Orange Runes offering more than Purple, Purple more than Blue, and so on. 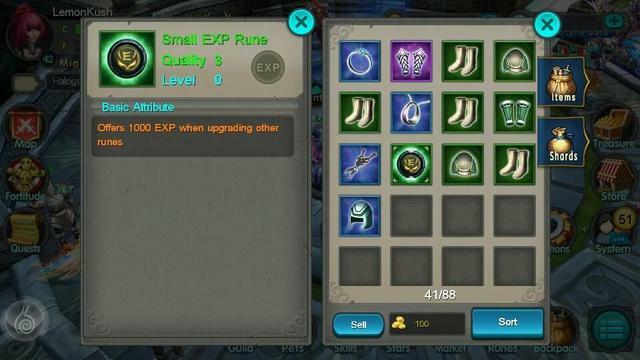 Besides basic Runes, there are also special EXP Runes. EXP Runes are runes that can be used only for upgrading Runes, but provide a much larger amount of experience to runes than a basic Rune. 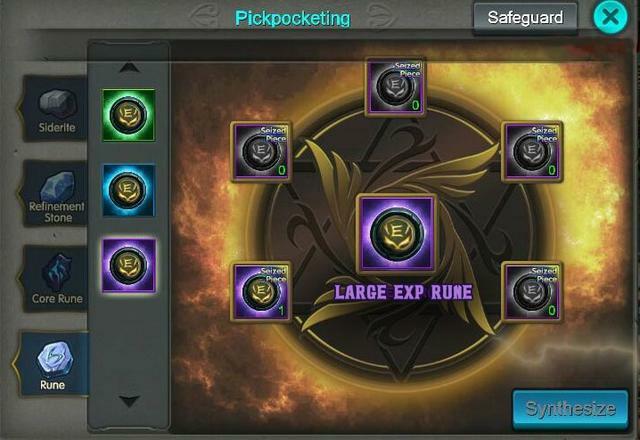 EXP runes can be obtained from pick pocketing, Daily Quests, as rewards in Instances, and special events. For Pickpocketing, the same principles apply as with Core Runes. The advantages of having a Rune Set, especially with 3 or 4 of the Set, are significant. With all your gear equipped with Runes, the stat boosts can really add up. Make sure you keep track of your Rune Sets, and don’t just chase the high Quality Runes – this will result in frustration and punching well below your weight. With all the different gear, it can be easy to lose track of Runes. “Oh,” you’ll say, “I’ll just use whatever Runes I have. I’ll put the best ones I can in each spot, upgrade them a bit, and I’ll be fine, right?” The answer – WRONG. There are a lot of sources of Runes in the game, and it’s important that you give the proper attention to them. Getting high level Runes takes time, patience, and planning. In the meantime, getting Purple sets of Runes on as much equipment as possible, and upgrading them through EXP Runes from Pickpocketing and Daily Quests is key. In the game, there will be a lot of new player / new server events to throw EXP Runes at you. Don’t use these without thinking, as they will dry out fast. Be sure to have a plan for how you will use your EXP Runes to maximize the outcome. General rule of thumb – don’t bother upgrading anything lower than Purple. Purple and Orange Runes will get a lot more bang for your buck, especially if you get them as Sets. Likewise, have a plan for how to get more EXP Runes. Put in the time to Pickpocket, and also check Daily Quests. This Guide was developed in collaboration with Lemon Kush from the Taichi Mastermind program. You can also gain runes via the map. Once you reach level 25 you can access Asgrabat and on level 45 you can reach Norar's woods. By clicking the people on the map you can get the chance to collect purple runes as well. I have 1 question that how can i activate the last line of rune? 713120148797920 wrote: I have 1 question that how can i activate the last line of rune? Hi, its not level of your rune but level of your piece of equipment. You need to refine your equip with refinement stones. Getting refinement stones is a long run so use the runes which you have activated fully. Fully activated green is better than not activated blue and so on. Quick correction: diamonds are also used to purchase orange rune shards in the smelt shop as shown on the picture you have. Might find some useful tips in this video. Is borik and grubly is a good tandem?